If you’re thinking about redesigning your kitchen or bathroom, chances are you’re at a loss for where to start the whole process. Schedule your very own tour of one of our showrooms to get those creative juices flowing. Our 4,500 square foot showroom at 2505 Philadelphia Pike in Claymont is conveniently located for our clients up north, while our 2,500 square foot showroom at 28429 DuPont Boulevard in Millsboro is just a short drive for our shore town clients. Both of these locations feature all of the products available to you, as well as the style options for each selection. You can even see samples of door styles, colors, and hardware to help you narrow your decision down. Being able to see, touch, and hold the materials we have for you to work with can make all the difference in the world when it comes to redesigning your kitchen or bathroom. Once you’ve selected your favorite looks, we’ll schedule a time for our team to visit your home and take all of the necessary measurements. This is also a perfect opportunity to review what was discussed in the showroom. By this time we’re sure you’ve had the chance to review all of the literature on the products you’ve selected. Feel free to ask our team any questions you may have as they’re taking their measurements. You can also chat further about your budget at this time. The Holcomb Cabinetry team is here to find the perfect products for you at a price you can afford. Our team is constantly gathering information to make your redesigned kitchen or bathroom perfect. Not only will we help you choose the right materials, but we’ll collect plenty of info based on your lifestyle choices, tastes, likes dislikes, must-haves and hate-to-haves. This is all very important when it comes to designing the space of your dreams! Using our collection of information, we’ll create a virtual design of your kitchen or bathroom, and invite you into our studio to see it. This design can be manipulated by our team to add the finishing touches and make everything look exactly the way you wanted it to. Not only that, but all three of these steps are absolutely FREE! 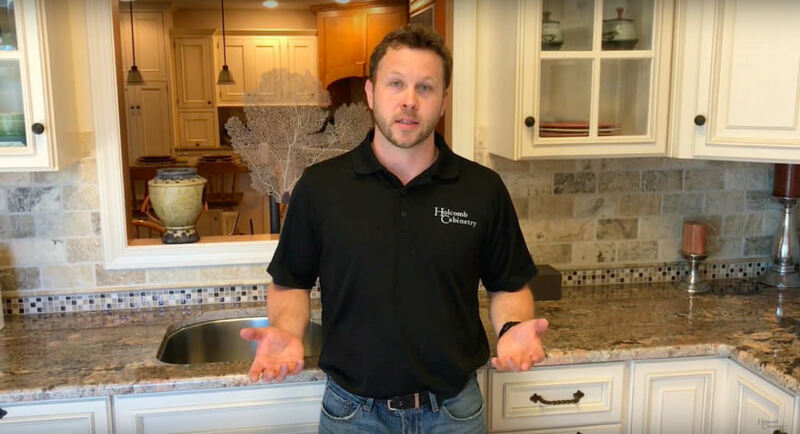 That’s right, Holcomb Cabinetry will lead you on a tour of our showroom, travel to your home to collect measurements, and create a virtual redesign of your kitchen or bathroom at absolutely no cost to you. How great is that? What are you waiting for? Click here to schedule your showroom tour with Holcomb Cabinetry today!